Currently, I am using a Canon 20D DSLR with a 28-135mm IS USM lens strapped onto it. I also have an Olympus SP-560UZ. The Olympus is a fairly advanced point-and-shoot which allows quite a bit of manual setting, and it has 18X zoom, which translates to something like a 435mm telephoto, and it goes really wide…10mm or so? Both of them are so great, I can’t begin to tell you! Oh, and I recently bought a nifty little gadget that allows me to open the Canon shutter wirelessly. 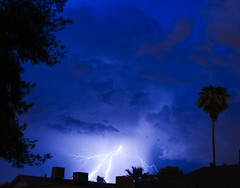 Makes it a breeze to photograph stuff like lightning, while sitting at my desk with the camera outside. Check my flickr stream for shots of that! Or, even better, I will add one here!